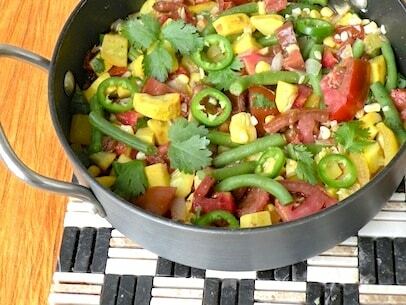 In this Southwestern variation of succotash, the bright melange of the freshest corn, tomatoes, summer squash and chilies makes for a wonderful celebration of the summer harvest. Serve with Easy Vegan Quasadillas or Soft Tacos for a tasty meal. I like to steam the green beans separately and add at the last minute, because their cook time is unpredictable, and I like them to be bright and just tender-crisp in the dish. Steam the green beans until they are tender-crisp. Refresh under cold water until they stop steaming and set aside until needed. 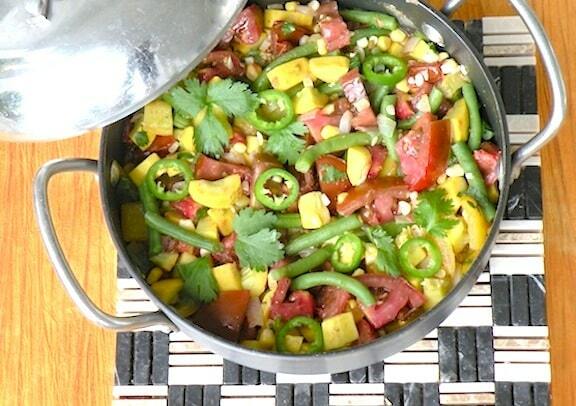 Heat the olive oil in a wide skillet or stir-fry pan. Add the onion and garlic and sauté over low heat until the onion is golden. Add all the remaining ingredients except the green beans and stir together well. Cover and cook gently for about 10 minutes, or until the corn and squash are just done. Add very small amounts of water as needed, just to keep the mixture moist — you don’t want it to get soupy. Add the steamed green beans and simmer for another 3 to 5 minutes. If you’re looking to use up more garden tomatoes, feel free to use more! If fresh tender green beans are unavailable, use organic frozen whole baby green beans.